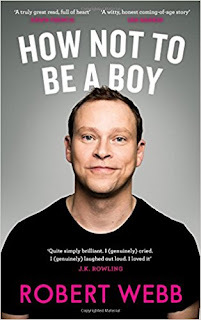 Listening to the first episode of Robert Webb's memoir How Not to Be a Boy, serialised this week on Radio 4, I was surprised to hear a reference to No Place Like Home. Of all the sitcoms in all the world this was the one which inspired him to become a performer - or at least set the seal on his decision. That night we're all in the living room watching the BBC sitcom No Place Like Home starring William Gaunt and a young Martin Clunes. What would it take, I wonder, to be allowed to do that as your job? It really doesn't look that hard. Does it look easy because they're very good at it? Or is it just easy? They don't seem to be doing it as well as John Cleese does it. Do they know? Do they go to the pub afterwards and say, 'Well, we can't all be John Cleese.' Or is it because of the script? Would the young, tall one with the big ears be as funny as John Cleese if he had some funnier lines? Maybe he would. This is serious. I lean in and look hard for something that Mr Clunes is doing that I couldn't do just as well. Hmm, for a start he's a grown-up who looks like he ought to be on TV rather than a Lincolnshire schoolboy who obviously mustn't. And he's very clear and confident. And he talks with that accent from the south of England that so many funny people on TV have. He just looks like he belongs there. How did he do that? Suddenly I have a name for that feeling I had in Dad's car on the way back from the Flashdance fireworks. That feeling, the one that made me blush, was an overwhelming desire to be famous. Essentially, then, No Place Like Home made a future in comedy seem possible for by virtue of the writing and acting not being offputtingly good. I get what he means, but for readers intrigued by this largely forgotten sitcom I'd like to bang the drum - softly - on its behalf. I didn't see No Place Like Home when when it was originally broadcast on BBC 1 in the mid eighties, but when all four series were repeated in rapid succession on the Drama channel in 2015 I felt impelled to record my responses in this blog (links below). As Webb suggests, there is a sense of some actors being somewhat underused. And yet ... well, read the posts, if you are so inclined. The gist of my case is that while it doesn't break any barriers there is a lot to enjoy - and the performers are indeed "very good at it." While it's great thing that digital TV's appetite for material has led to the revival of so many sitcoms there is one unfortunate effect of seeing all four series of a show in a solid slab rather than spread out over several years. You quickly learn whether some promising new development - the blossoming of a character, say, or the possibility of a change of emphasis - is actually followed through. And that, I'm afraid, explains why, after four posts, I lost interest in further monitoring of the show. Not that it was bad but there seemed no likelihood of further surprises. With such a large cast some performers, including Liz Crowther and Helen Dorward, had the briefest of moments in the sun. No Place Like Home remains very enjoyable, nevertheless, and can be recommended to the reader. There may have been occasional inconsistencies in tone but the playing was always done with verve, and there was a real warmth about proceedings. 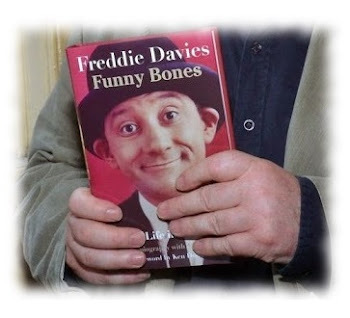 On a related note, Ben Elton has recently been on TV, delivering the first Ronnie Barker Memorial Lecture, basically to say that broad sitcoms, shot with an audience, are good. If No Place Like Home is remembered by more people than Robert Webb it's likely to be as a footnote in sitcom history than anything else. It provided the first glimpse of Martin Clunes in the genre he would later master - with the help of some rattling good scripts by Simon Nye. But on the character front No Place ... works, most of the time. It may have had no pretentions to be anything other than a mainstream comedy but the parade of rich and strange individuals who perk up proceedings are to be treasured. Listen to the first episode of Robert Webb's How Not to Be a Boy on BBC iplayer here.